Despite having been out pretty late the night before I surprised myself when I woke up only 6 hours later and not really feeling like I had as much to drink as I had the night before, meaning my biggest two fears didn’t happen. Now I could still go find a good breakfast and a few other things before heading to the airport that afternoon. Once out of my hotel I had decided to go in search of a place that I had read about called the Clinton St. Baking Company & Restaurant. Located in the lower east side, their menu online looked very promising. In fact by the time I made it down there, it looked like many others in NYC had the same idea and the place was packed. They don’t have very many tables and told me that it would be over an hour wait for me to enjoy breakfast. No matter how good something might be, an hour is just too long of a wait. With my plan now in complete disarray, I started to wander around and a few blocks over I found the Cornerstone Cafe. From the outside it looked like a nice sidewalk cafe, although most of the patrons were inside. I found myself a table and found myself ordering for the second day in a row, Pancakes. Now they had all sorts of good looking options on the menu, don’t get me wrong, but for whatever reason I just found myself craving them again. And they were pretty good too; the only downside being that they soaked up syrup like a sponge! 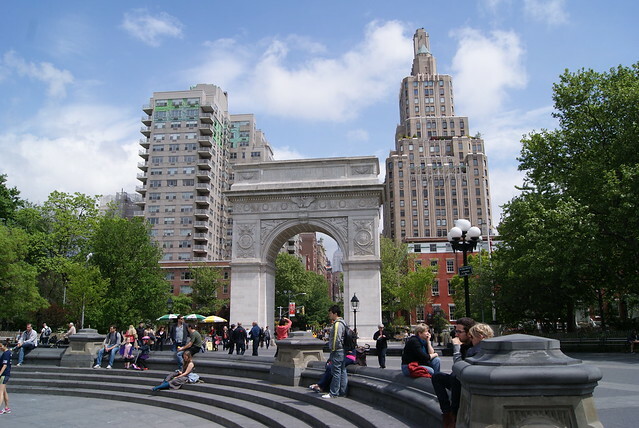 After breakfast I wasn’t sure what I would really have time to do for the rest of the day and I thought about a few different options including going to Empire State Building, but found myself heading to Washington Square Park instead. I think I have mentioned plenty of times before that I really like just hanging out in this small park. Whether I’m kicking back with a book next to the fountain or just watching the people in the park it’s almost always a good decision. And with with weather that day, it was an excellent decision. I didn’t have a book with me this time, so I sat and watched the people. The fountain wasn’t running so there were little kids running around and playing, while some guy was playing the piano and others were just relaxing like me. I lost track of how long I was here for, but eventually I decided to seek out lunch nearby. After some wandering around the adjacent streets, I decided to poke my head into ‘wichcraft. I had seen this place before in the past and I wondered what it was all about…and it turned out to be all about sandwiches. They had all sorts of good looking ones, but the one that caught my eye was the meatloaf sandwich. It’s been forever since I last had one of those and I just knew that I had to go for it…and it was pretty darn good. Plus the people working there were pretty friendly and it wasn’t super busy. Nice spot for a quick lunch. 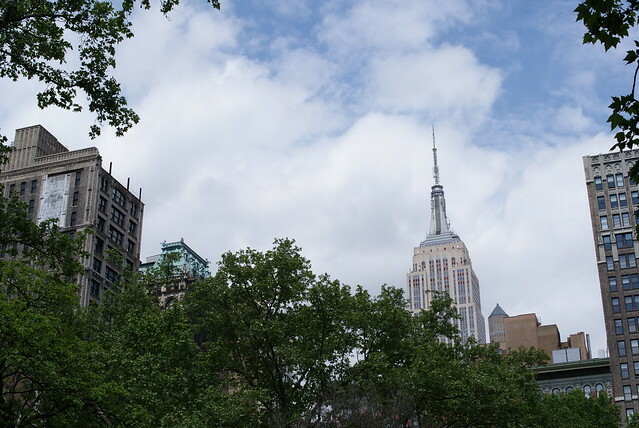 Once I was done here, I figured that maybe I should try to go for the Empire State Building again. Looking at the time however, I noticed that it was almost 1pm and with my flight leaving in just over three hours I decided to start making my way back to my hotel. 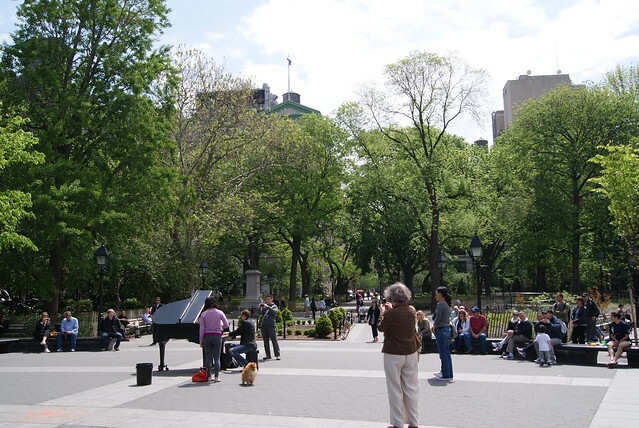 However I did take a slightly leisurely path, walking down a few side streets, up through Union Square Park and finally to Madison Square Park. I had this bright idea to grab a drink at the Shake Shack there, but the line was beyond long! From there I jumped on a Local 6 train and was back at the W to claim my gear. After checking out I jumped into the first taxi that I saw outside. First of all, the driver didn’t even jump out to help with luggage (not that I needed help) or open the trunk, so I wound up throwing my bags in the back seat with me. I also did not notice that the driver wasn’t using his meter and was going a route that I was not familiar with. 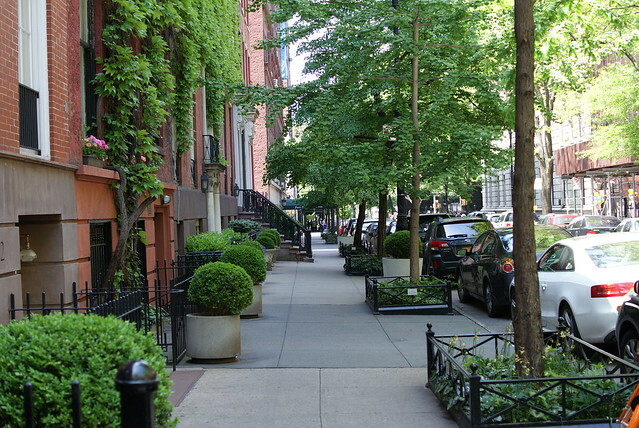 He avoided the tunnels and took surface streets through Long Island City. Before he even arrived at the airport, he had input his flat fee ($35) and had me pay in advance of arriving. Since a cab usually costs around $25 without tip to/from LGA I had been taken for an extra $10. I’m guessing he was ripping off his employer too or something as well going about this method. It’s actually the first time that this has happened to me in NYC and I think in the future I am just going to have to keep an eye on the meter as I get in. Luckily it wasn’t any worse than it was. Anyways, once at LaGuardia, I made my way for the Sky Priority security line right away since I had a mobile boarding pass and had practically no wait. Once I got to the TSA ID Checker, I was informed that I had been selected under the TSA PreCheck program and that I could use a special screening lane off to the side – actually since opting in months ago this was the first time I had been selected. Most airports I fly from do not have this deployed yet. For those not familiar with the PreCheck program, as a frequent flyer, I have opted in to having some sort of background check ran by the TSA that allows for low-risk fliers to be given less invasive security screenings. Currently only frequent fliers from certain airlines and those with trusted traveler memberships like CBP’s Global Entry program are currently being accepted. As a result I only had to pass through a metal detector (no backscatter or mmW scanners), my belt and shoes could stay on, liquids/gels could stay in my bag and I didn’t have to unzip my TSA-compliant laptop compartment in my messenger bag for screening. As a result, I cleared security incredibly quick. As I made my way to the gate I noticed how crowded it was. It looks like some school had taken a trip to NYC and were all on my flight. All I know was that I was glad my upgrade had cleared and I wouldn’t be surrounded by 30 middle school kids that were clearly excited. 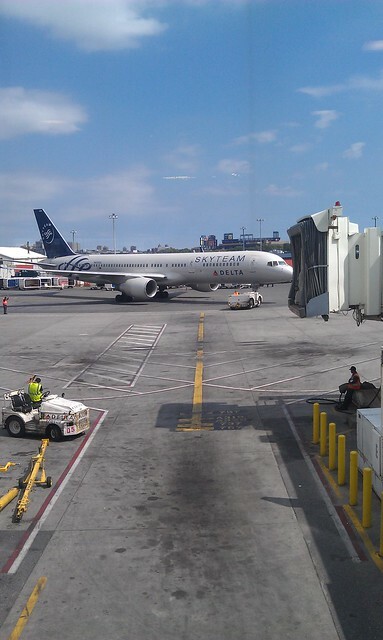 On another note as I watched the plane being towed into the gate I noticed that I would finally get to fly on one of Delta’s SkyTeam Alliance livery planes. Nothing special aside from the paint job, but interesting that I had not been on one yet. 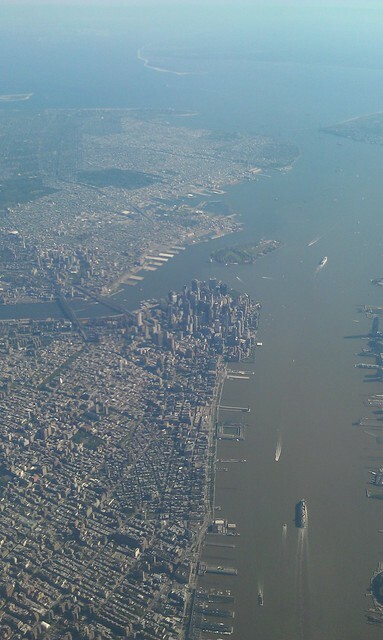 With an on time departure and take off, the aircraft rocketed up into the skies above NYC and we were already past 10,000 feet as we passed over midtown Manhattan and the Hudson river, giving great views of the city and of EWR as we headed south. Actually looking at one of my photos I took with my phone I think the large ship sailing down the river was the NCL cruise ship I saw the other day at the pier next to the USS Intrepid. Since it was a little bumpy, they waited a bit before starting to serve dinner. Tonight there was an option of a salad or a Chicken Caprese sandwich. I went with the sandwich and it came with the usual side dish of fruit, and a slice of chocolate cake. 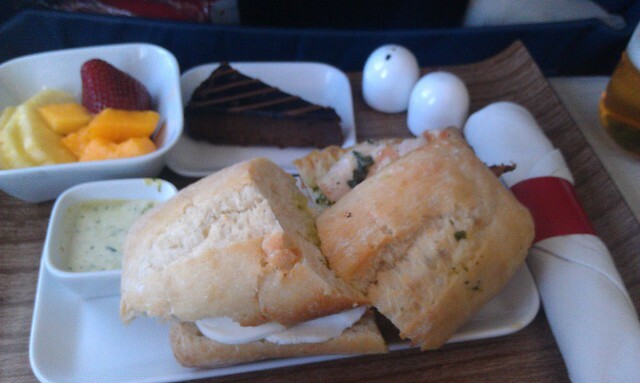 Not a bad meal – Delta has seemed to increase both the variety and quality of on-board food offerings lately. The arrival into Atlanta was on time and I didn’t have much to do during my layover, so I just found myself killing time surfing the web from the free wifi in the Concourse E food court. My flight was departing from Concourse E as well (for whatever reason the evening mainline flight seems to more often than not, depart from here these days), so I didn’t have far to wander. Again my upgrade had cleared, and 40 minutes after take off I was walking out of the terminal in Panama City heading to my car. Overall, it was another successful trip to New York. As always, I seem to find enough to do and have a good time. I’ll have to plan another trip there for later this year, maybe in the fall when it starts to cool down a bit again and the leaves start to change colors. 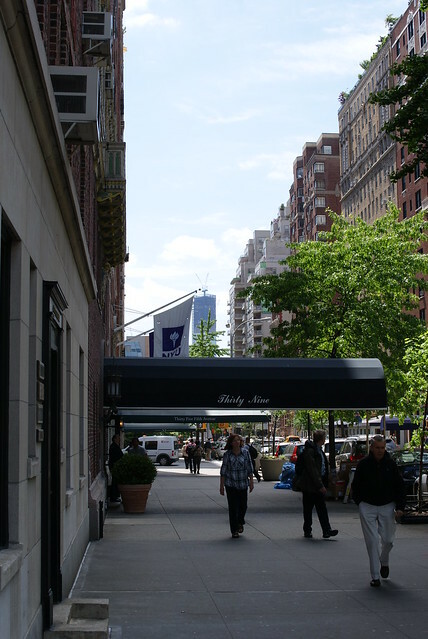 This entry was posted in Delta, NYC, Travel, Trip Report. Bookmark the permalink. Follow any comments here with the RSS feed for this post. Post a comment or leave a trackback: Trackback URL.